Map It! 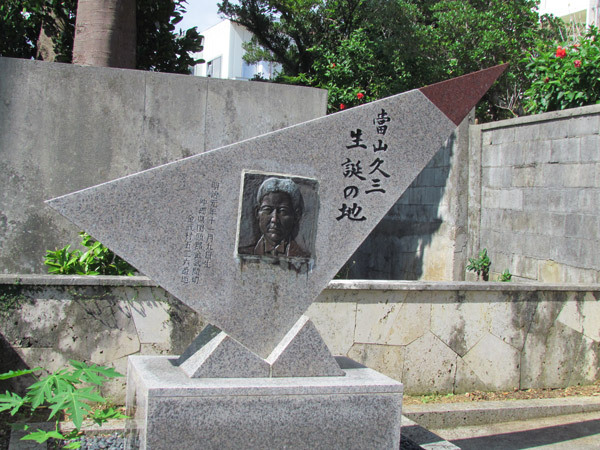 Okinawa: "The Birth Place of Toyoma Kyuzo"
This Stone Monument marks the location where Toyoma Kyuzo was born. The previous post discussed the significant contribution of Toyoma Kyuzo and the impact he had on Okinawan emigration. This post is for the curious minded and history buffs in light of the 5th Uchinanchu World Festival . 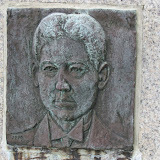 The above picture marks the birth place of Mr. Toyoma Kyuzo in Kin Town. The monument lies between two modern built houses. I gather his house has long since been demolished being that Mr. Kyuzo was born on November 9th, 1868. Getting there. The best route to take is starting from the Family Mart off of Highway 329. From there you will go down a hill with a green paved road. You will see the Okawa Natural Spring to your left. Once you pass the spring, proceed straight ahead. You will see a two-story pink house. Go in that direction. Make a left hand turn on the intersection where the pink house is located. Next to this house is the monument. 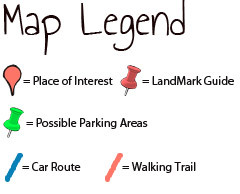 I added some landmarks to help you get there. Reader's note: Not all icons of nearby areas in Kin Town will not be visible on the above map. For example, the thumbtack for Okawa, the natural spring, does not appear on this map. This is because Google Maps starts a new complete Map Page when a certain number of Icons have been marked. Don't worry! The other icons are still there. To see the other places of interest on the map, click the 'View Map It! Okinawa in a large Map' link and scroll down at the bottom where you see the Previous and Next Link. Also, you can click at the bottom of the post to see 'other places of interest nearby'. I have provided feedback to Google that they should show everything on the map. Other places of interest nearby: Kin Kannonji Temple, O-kawa, Statue of Oshiro Kozo, Kin Watch Tower, Kin's Castle Rock, Kinjo's Used Goods, Kin Town's Hidden Nature Trail, Richamocha Cafe, The Statue of Toyoma Kyuzo, Kin Town's History Chronicles, Kin Town's Cherry Blossom Way.